1822 Oct. 11. Thomas Jefferson, Monticello to Arthur S. Brockenbrough, University of Virginia. ALS. 2 pp. endorsed. 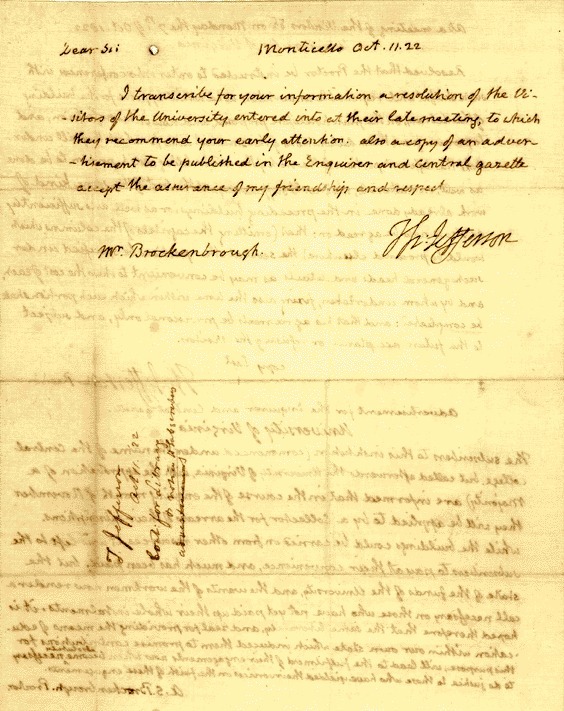 In 1822 Jefferson sent a copy of resolution of the Board of Visitors, authorizing the building of the library and an advertisement for the Richmond Enquirer and the Charlottesville Central Gazette regarding collection of University subscriptions in arrears. and by whom undertaken, fixing also the time within which each portion shall be compleated [sic]: and that his agreements be provisional only, and subject to the future acceptance or refusal of the Visitors. The subscribers to this institution (commenced under the name of the Central College, but called afterwards the University of Virginia, with the approbation of a Majority) are informed that in the course of the ensuing month of November they will be applied to by a Collector for the arrears of their subscriptions. While the buildings could be carried on from other resources it was left to the subscribers to pay at their convenience, and much has been paid. but [sic] the state of the funds of the University, and the wants of the workmen now render a call necessary on those who have not yet paid up their whole instalments. it [sic] is hoped therefore that the same liberality, and zeal for providing the means of education within our own state which induced them to promise contributions for this purpose, will lead to the fulfilment [sic] of their engagements now when become absolutely necessary to do justice to those who have yielded their services on the faith of these engagements.